How do you Charge your Electronics? What’s the best way to take control of all of the electronics being charged in your house? I’m a fairly organized person. I prefer to have things in order, and put away as much as possible. But here is my current dilemma, there are chargers everywhere in our house. I have tried and tried to corral the cords, but they always end up back in their own little corners. Near a chair here, or a table there. For our house, The Party House that is, we have a never-ending stream of cords, especially in the living room. A big charging station in my office, which is closest to the living room by the way. This has definitely helped the situation. 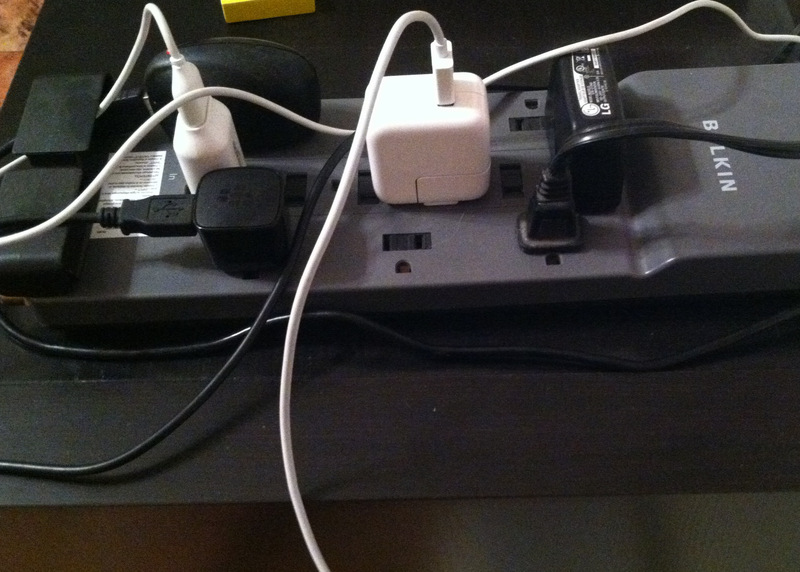 But, when Travel Man comes home from a trip the chargers and cords multiply by leaps and bounds! We have quite a few phones in the family that all use a similar charger. I thought with my charging station some of the straggling chargers in the house would disappear and everyone could just use my office charging station. The chargers around the house have diminished slightly, but not as much as I had hoped. Oh, and how many of you use your cell phone for an alarm clock too? So that means you have to be able to charge your phone next to your bed. Another cord! See what I mean. It’s getting almost to the level of the Tupperware dilemma. You know how you have that one piece of Tupperware that you can’t find the lid for, or you have a lot of lids and no bowl. It’s like they duplicate themselves when you are not looking! If you have any suggestions for taking control of the “charging” dilemma please leave me a comment and let me know how you’re handling this situation. Maybe it’s not a dilemma for you, I’d love to hear from you. I can only imagine what Charger Man does to the whole system. We definitely have to work together at keeping things straightened out and not tangled up! Thanks for stopping by.